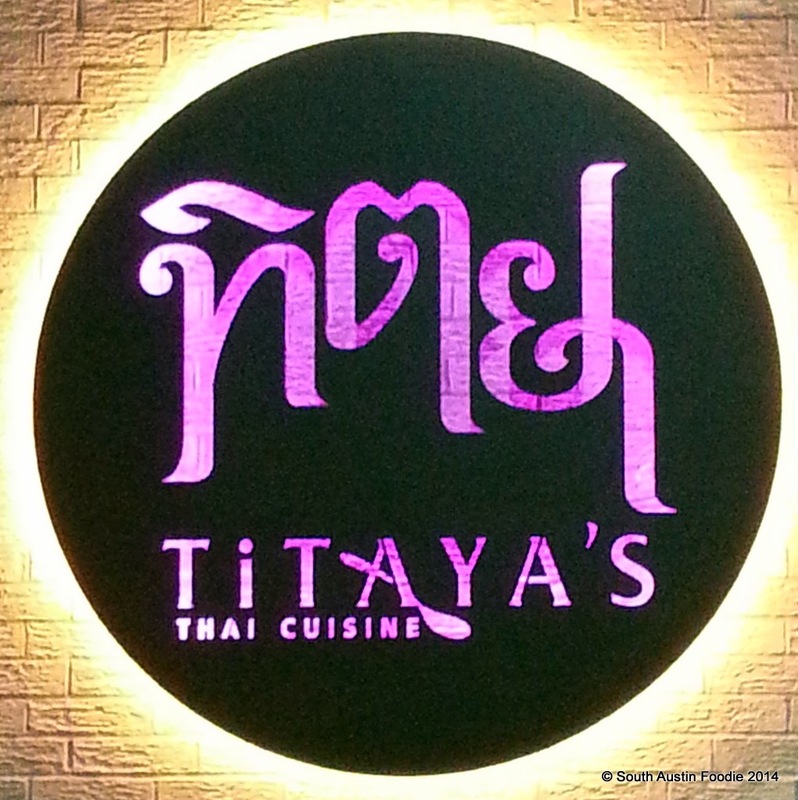 Many an Austinite mourned the prolonged closure of Titaya's Thai Cuisine as they remodeled the restaurant and updated the menu. 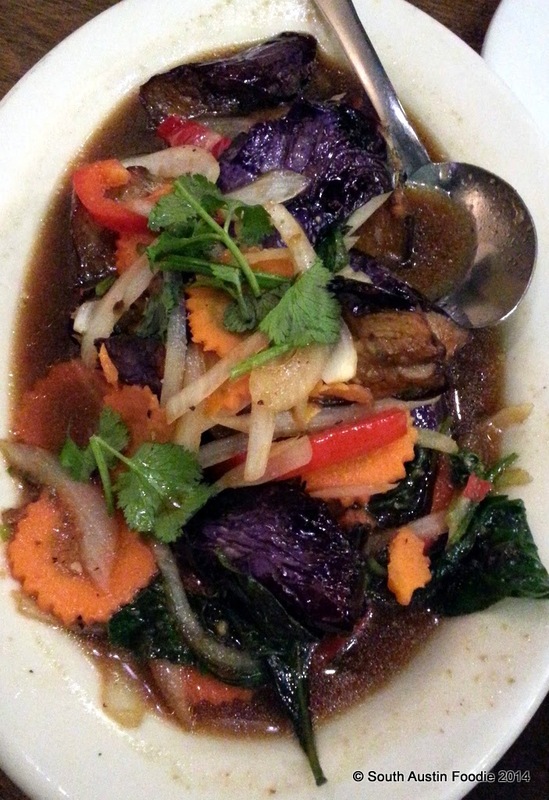 Many of those have long thought that Titaya's was the best Thai food in town. And after what seemed like an eternity, they reopened last month to much fanfare and rejoicing. Those fans may still think it's the best Thai food in town, but while my recent meal was solid, I would beg to differ. The first Sunday of SXSW, and I had friends in from out of town. 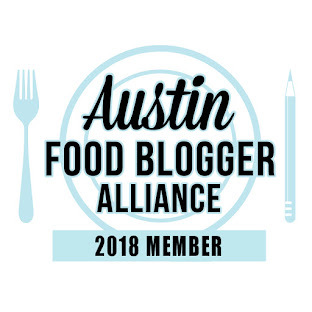 They also have friends living in north-central Austin, and Titaya's was suggested as the place for a 6 pm meet up, for four adults, one 5 year old (with an adventurous palate! ), and one infant. We had about a 15 minute wait, which wasn't too bad. Fortunately, we were seated in one of the large booths which was quite comfortable for our group. The booth next to us had eight adults packed into it and then two high chairs at the end of the table! 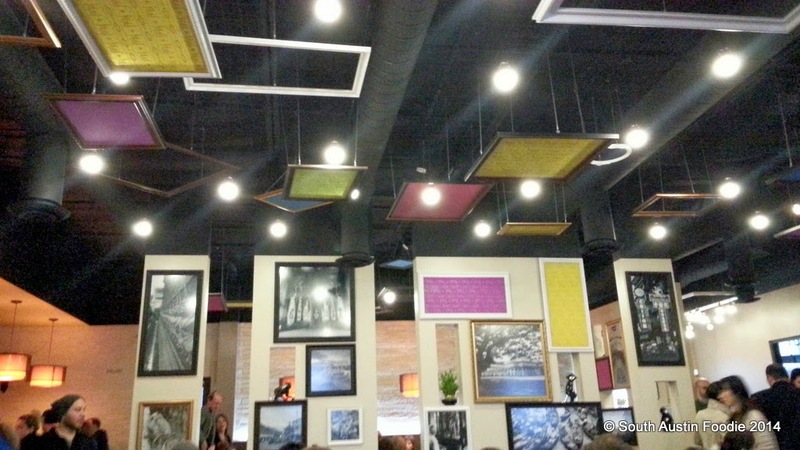 The initial wait for a table gave me a few minutes to look at the nicely updated decor: many framed pictures, framed pieces of cloth hanging from the ceiling, a wall of candles. Very colorful and fun. 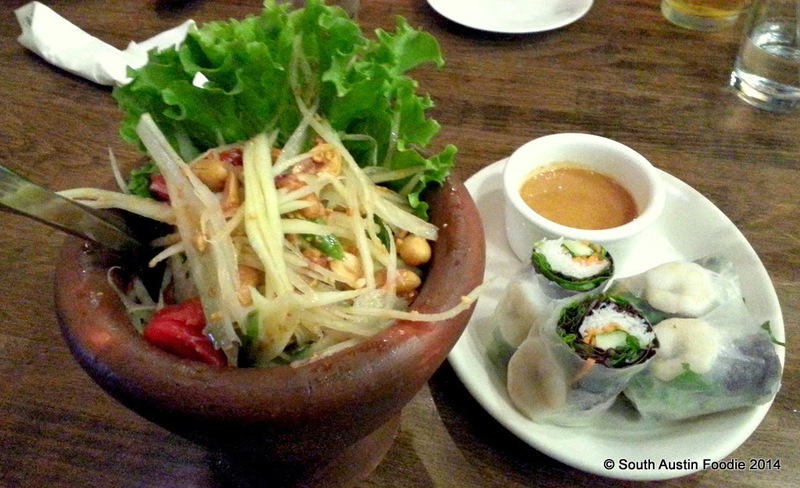 We started with the som tum (green papaya salad) and fresh spring rolls with shrimp. The som tum comes in a nice mortar and pestle container, and while very fresh, it didn't have the contrast of flavors from the fish sauce or the spiciness that I have come to expect with this dish. Half the group were vegetarians, so we stuck to seafood and tofu as our proteins. Definitely my favorite dish was the #T4 Chuu Chee Pla, basa (catfish), which was battered and fried, and served with red curry. We asked for the curry not to be too hot, since we had a child with us, and I think the heat level was perfect. 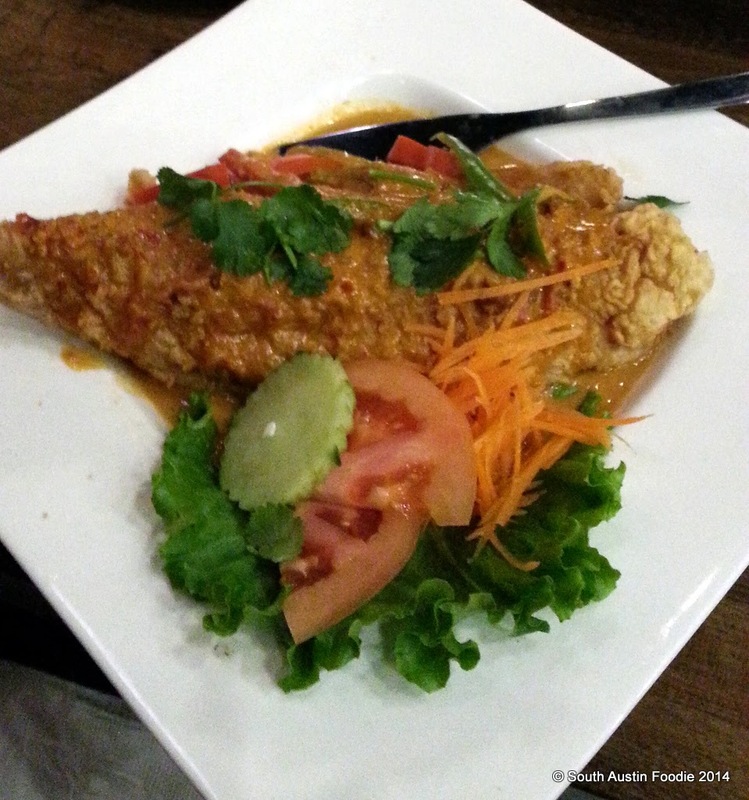 Lots of good flavors in the piquant red curry, and the fish was very nice and crispy. Winner. Titaya's pad thai (with shrimp) was okay; for me though it was a bit too sweet, and not enough tamarind, which provides a sweet and twangy taste. The texture of the noodles was good, but just not that flavorful. Very nice fresh bean sprouts. 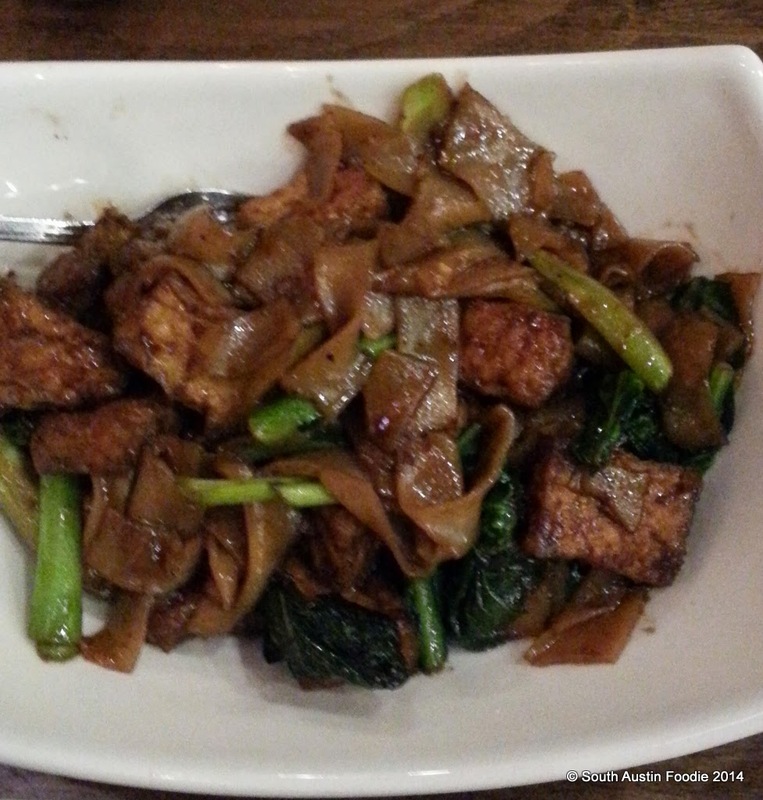 The pad see ew was another dish that for me missed the mark. Typically, it's wide rice noodles in a brown gravy/sauce. There was no other flavor to the sauce other than soy, and the noodles seemed a bit thick, and the fried tofu was very chewy. Yes, pad see ew is a soy-based dish, but usually there's some fish sauce and sweetness, not just soy sauce! The eggplant with mixed veggies was not only colorful, but had a nice little kick to it too. Good consistency to the eggplant, and the stir fried veggies still had some snap to them. So am I being overly picky? Perhaps. (Though I have talked with one friend who was a huge Titaya's fanatic before the remodel, and he said he was a bit disappointed with their food on his return visit.) Only being about a month into their re-opening, is it a bit too early to tell how things will shake down? Perhaps. Would I eat there again? Yes. But I would like to try some of the dishes with animal protein, not just vegetarian items. But judging from the large numbers of people waiting for tables throughout our meal, Titaya's is quickly making up for those months they were closed, and they will continue to see people flocking to them. 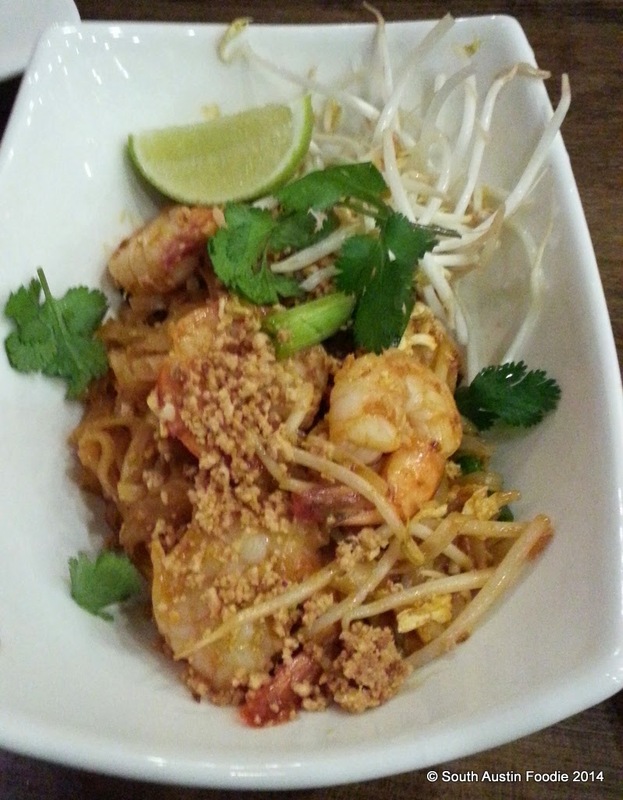 As for me, I will stay in my neighborhood and head to Thai Fresh for a great pad thai dish. Sorry for the slightly blurry photos; when dining with groups (and when there are people I don't know) I try to get my pictures done in a hurry so they're not waiting on me to get a shot. I went there a week after you, with all the excitment i had went to waste. im sure they dont have the same chef nor same recipe for pad thai. will go back to try the fish later though. Thanks for the note. Yeah, I still want to give them a chance, and just wonder if they need a little time to round out their recipes, especially for the high volume of customers they seem to be having. I *think* the chef is the brother of the owner, one of the former owners of SPIN Modern Thai in Cedar Park, which closed last year. I had the same feeling after visiting, just once though… I'd like to go back and try some different things. Honestly I never understood the Titaya's hype. I thought it was a vegetarian thing since they are the most vegetarian friendly Thai place so that's too bad to hear that the veg options weren't so good now. I think Sway, Little Thai Food, Thai Fresh, and Madam Mam's are all better (though the latter isn't veg friendly). I need to check out Little Thai Food; is Mam's/Sap's not really vegetarian friendly? Bummer! I like a lot of Sap's dishes (and feel like I know what some of the better ones are), but tend to steer clear of their noodle dishes, but obviously the selections are different for vegetarians. The noodles aren't great at Little Thai food either (WTF Austin) BUT I adore their Tom Kha and I like their fried rice a lot too and they are super nice. Cash only. Good to know! I do love a good tom kha! (I've always thought the one at Sap's is great.) Have you been to the Try Mai Thai trailer? Don't know how veg friendly they are; I went to a tasting for them once ages ago, and their tom kha was delish. I was a regular at the old Titaya's, and I have given their new spin 3 chances. This new Titaya's has several things that will prevent me from going back. They are (in no particular order): rude hostesses, a poor seating regiment that makes people wait when tables are available. Dishes that are half the size of the previous Titaya's, but sometimes 20% more expensive. The removal of some of my favorite dishes. Poorly trained new servers. And most depressingly, a dramatic lowering in the quality of their food. Their new chef knows how to make the food look more artistic, but quite frankly, it tastes like crap. 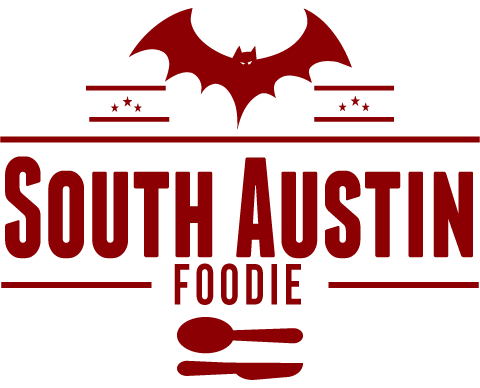 For us north Austin folks, many of us now go to Sap's, Madam Mam, or Thai kitchen. Titaya's chases away many former loyal customers. I will let the foodie hipsters continue to eat there in my place, enjoying the hype over substance. Thanks for the note; great constructive criticism too, and you've been there 3 times! And agreed, let others bask in the hype.... I will seek out GOOD FOOD!